Our thanks to Hank Landau and his colleagues for their help with this post. For 13 weeks in the spring and summer of 1970, 600 sheet metal workers, members of Local 83, went out on strike. All of the other unions that made up the Albany Building and Construction Trades’ Council had settled with employers before their contract expired, but the sheet metal workers’ local held out. They wanted parity with other skilled trades, and in the end, they received not only the wage increase they sought, but the status, too. “We are no longer the unrecognized trade,” declared Hank Landau, Local 83’s President and Business Manager in the union’s December 1970 newsletter. Hank in front of the Justice Building, ca. 1970s. Hank Landau. Albany’s South Mall was just one of the sites deeply affected by the strike. Several area shopping centers were also hit, including the Northway and Mohawk Malls, as well as construction at nearby Skidmore and Union College campuses. The OGS Commissioner CVR Schuyler kept Gov. Nelson Rockefeller abreast of strike developments, which, by mid-July, “has affected nearly every building project on South Mall…numerous operations are coming to a halt.” Contractors “were forced to jump around in a very inefficient manner.” And the strike seriously hampered progress on the Swan Street building, the project nearest completion in 1970. It also prevented the enclosure of Agency Building #4 by winter. As a result, temporary heat would be needed for the winter, adding time and expense and causing new complications, because provision of temporary heat was typically performed by sheet metal workers. Hank at work, ca. 1950s. Hank Landau. From the perspective of the other union leaders, the sheet metal workers’ strike must have seemed brazen. Five years earlier during the 1965 building trades strike, Hank was the head of the Tri-City Building Trades Council, and he led Local 83, along with the other unions in negotiations with the Eastern Contractors’ Association. At that time, the construction workers demanded a 35-hour week, not because they sought overtime, Hank would tell the Times-Union but because they feared automation would threaten their jobs. “A 40-hour week is fine right now, but we need to prepare for the future,” he said. The construction boom facilitated the sheet metal workers’ strike. In 1970, Local 83’s members found as much work as they wanted. Some journeyed outside the area. Hank remembers, “If they were willing to travel, we had a job for them.” Others, like Earl Brockaway of Schenectady, kept busy that summer making three picnic tables a day for paying customers. Most of the picketing took place at sheet metal shops, but sometimes metal workers walked the picket line at the Swan Street gate to the South Mall. Picket duty, however, was reviled by the union members, who had plenty of work to keep them occupied and employed. As a result, the local’s apprentices did most of the walking. Like other labor leaders at the time, Hank understood that the construction boom was a bubble. The ranks of his union had nearly doubled in a few short years, as large office and university buildings rose throughout the state. Each of these buildings required the ventilation, heating, and cooling systems constructed by his members. Hank in his Navy uniform, 1945. Hank Landau. Only a few months after the strike ended, sheet metal jobs were still going strong. Local 83 members reported that other tradesmen congratulated them on its 97-cent increase. But the sheet metal workers never got to enjoy the fruit of their victory. 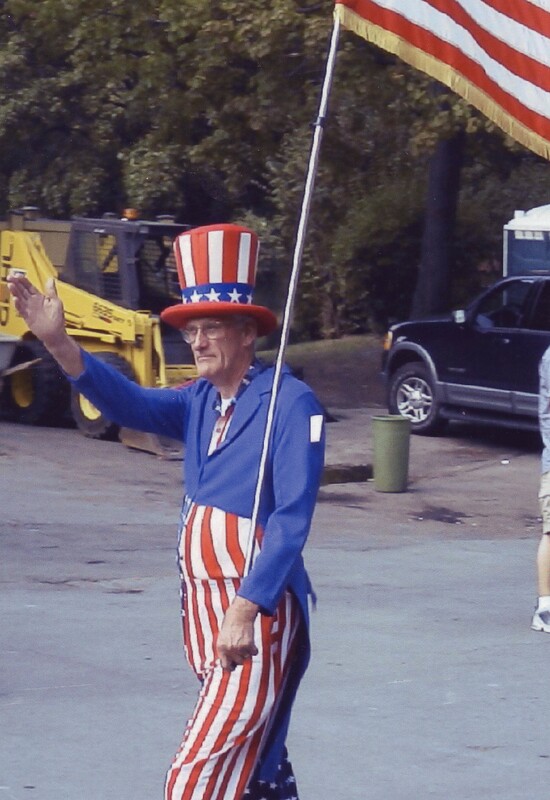 Hank dressed as Uncle Sam for Albany’s 2001 Labor Day parade. Hank Landau. In early 1971, President Nixon created a Construction Industry Stabilization Board to “attack the wage and price spiral.” The board reviewed and reversed Local 83’s hard-won wage increase. Denny Burns, a Local 83 retiree, remembers that they had that raise for “maybe about a week.” Then Nixon took it away. When the worked diminished, Local 83’s boomers, who had come to Albany from other Sheet Metal locals form around the State, left town. The union’s membership declined to its pre-Mall levels. “A job like the South Mall doesn’t come around very often,” recalled Hank. I felt so sad, seeing that Nixon took away their hard-won wage hike. I wish you had explained more about that. I did not know the government could do that back then. Thanks for the feedback! We’ll remember to add more about the Construction Industry Stabilization Board when it comes time to write the book.